OptixEQ is pleased to announce that Toby Turrell and Donald Harris of WINNERS CARD have teamed up with OptixEQ to bring their WINNERS WORKS product to the OptixNOTES and OptixGRID platforms. This new feature will provide historical workout information, color-coding of positive and negative workout grades, and special “clocker” keywords to help assess the quality of a morning workout. 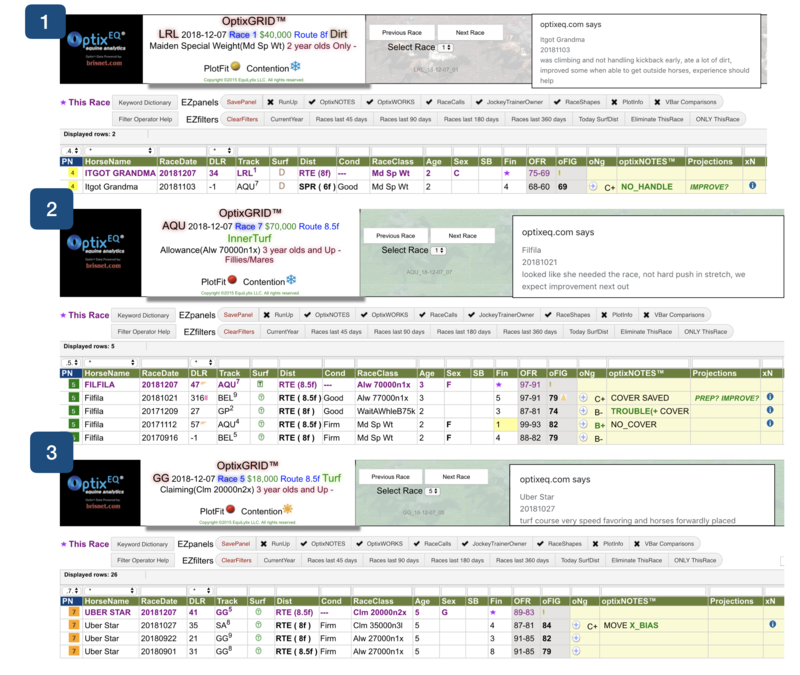 The OptixPLOT is a pace handicapping tool that allows horseplayers to quickly assess the pace-dynamics of a race, while also incorporating the traditional elements of handicapping—including class, form, speed, and pace—so that users can analyze a race in a completely revolutionary way. Through the use of proprietary data, OptixEQ has created a unique way of handicapping a race by plotting horses on a graph, along with their relevant running styles and their finishing ability, allowing players to visualize how a race is likely to unfold. The OptixGRID provides players with a detailed, interactive, and sortable past-performance platform to fully enhance their handicapping experience. The OptixGRID offers several unique, innovative, and proprietary data fields—from our own proprietary speed-figures to historical OptixPLOT, the OptixGRID interface provides players with all of the necessary tools to handicap a race. OptixGRID is included FREE with any OptixPLOT or OptixNOTES purchase. With our OptixNOTES, EquiLytix has created a new, interpretive methodology for visually rating a horse’s overall performance or trip. By using a consistent process and common language, EquiLytix has built an effective analytical reporting tool that will help assess a horse’s form-cycle improvement or regression. It’s more than just trip notes.